McRories 1 Man Live Electronic Variety Show has Been Invited back after a sucessfull 3 day show in the Living Sky casino . The Patrons and Staff were so impressed with the multi-media show and variety of music , they have re-booked the act ! 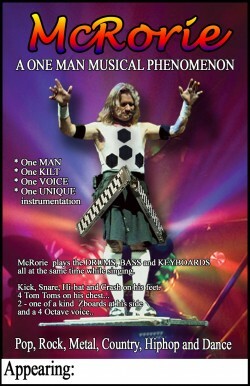 "McRorie played at our casino and thoroughly impressed our patrons. Not only is his music excellent but he is a skilled performer. The crowd was extremely engaged in his show and we received several positive comments raving about it and requesting we book him back again. His show is also entirely self-contained as he brings all his own equipment – including lighting and video production. Small stage size is not an issue as he is a single performer. We look forward to having him back. "